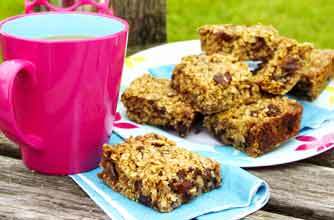 Full of fruit and a great boost of energy, these date and orange flapjacks will come in really handy over the festive period if you have lots of fruit to use up. Cut the butter into cubes and place it in a pan, along with the sugar and golden syrup. Place the pan over a low heat and stir until the butter and sugar have both melted. Stir in the cinnamon and orange rind. Tip the oats into a bowl and stir in the dates. Pour the melted butter mixture into the oats and mix well. Tip this mixture into the lined tin and level it out and press it down well. Bake the flapjack in the centre of the oven for 40-50 mins, until it’s starting to turn a darker colour around the edges. Remove the tin from the oven and mark the flapjack into 15 squares, cutting in 3 lengthways and then into 5 widthways. Leave to cool in the tin. When cold, use the lining paper to lift the flapjack out of the tin and then cut or break along the marked lines. The cooled flapjack can be wrapped in a freezer bag and frozen for up to 1 month. Allow it to defrost thoroughly before separating it into fingers.